Oppression Must Stop . . . This family is from another era but what they were suffering is still going on—oppression of most of the population by those in authority, whether governmental or corporate. This is the second post in direct response to a recent survey (“What Should Be Our Greatest Concern?”). Our last post explored the Global Water Crisis—number one concern of readers taking the survey. This post will bring two issues together: one from the second greatest concerns—Human Rights; and, one from fifth place—Economic Collapse. “Bahá’u’lláh set forth principles of guidance and teaching for economic readjustment. Regulations were revealed by Him which insure the welfare of the commonwealth. As the rich man enjoys his life surrounded by ease and luxuries, so the poor man must likewise have a home and be provided with sustenance and comforts commensurate with his needs. This readjustment of the social economic is of the greatest importance inasmuch as it insures the stability of the world of humanity; and until it is effected, happiness and prosperity are impossible. The Girl Effect, Revisited . . . 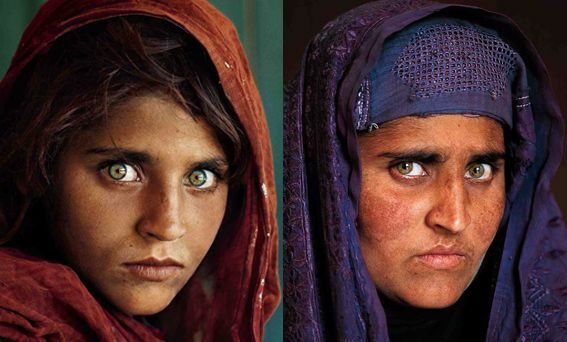 Both images (the same person) are from National Geographic. The one on the left taken in 1984, the right in 2002, in Afghanistan. This is a story repeated far too often in our world but there is strong reason for hope! One among many reasons for hope is a site called The Girl Effect and I can’t urge you strongly enough to click that link and at least watch the really awesome video ! From OneWorld.net: “The $700 billion bailout package for Wall Street recently passed by the U.S. government to mitigate the financial crisis ‘could have wiped out the last traces of poverty, hunger, malnutrition and squalor from the face of the Earth,’ said food and trade policy analyst Devinder Sharma. So, the financiers who caused the crisis (and made the gap between affluent and squalid wider) are to be preferred over millions of other members of our Human Family? Where is the justice in this situation? How long will this assault on virtue and morality continue? How the hell do the perpetrators of such vile imbalances sleep at night? It’s become fairly obvious that purely economic or political solutions to global crises don’t work. It’s time to realize why these “experts” in global business can’t end our world’s problems. “The fundamentals of the whole economic condition are divine in nature and are associated with the world of the heart and spirit…. Hearts must be so cemented together, love must become so dominant that the rich shall most willingly extend assistance to the poor and take steps to establish these economic adjustments permanently. If it is accomplished in this way, it will be most praiseworthy because then it will be for the sake of God and in the pathway of His service. For example, it will be as if the rich inhabitants of a city should say, ‘It is neither just nor lawful that we should possess great wealth while there is abject poverty in this community,’ and then willingly give their wealth to the poor, retaining only as much as will enable them to live comfortably.